Measures 14 by 8-2/3 inches by 14 inches. Included accessories: Flat beater, dough hook, wire whip, and power hub. ATTENTION ALL CUSTOMERS: ALL ELECTRONIC ITEMS ARE 110V. 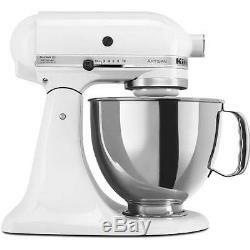 The item "KitchenAid Stand Mixer tilt 5 Quart RRK150wh Artisan Tilt White" is in sale since Monday, January 30, 2012. This item is in the category "Home & Garden\Kitchen, Dining & Bar\Small Kitchen Appliances\Mixers (Countertop)". The seller is "usa-world-sales" and is located in Los Angeles, California.